I’ve been seeing articles pop up all over the web about how just because something is a salad doesn’t mean that it’s healthy. Very true. Here are forty unhealthy salads, for example. 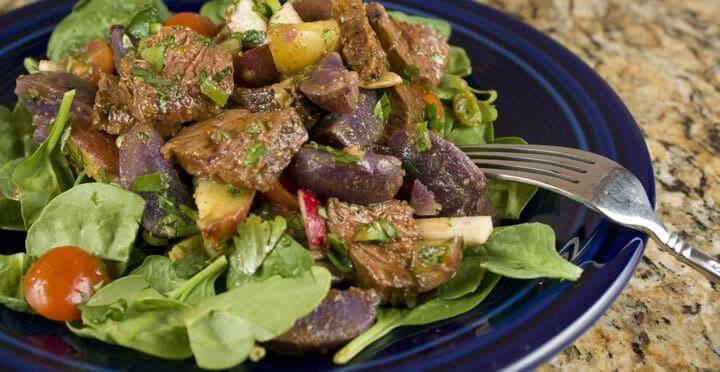 You might think this Steak and Potato Salad would fall into that unhealthy salad category because when people think meat and potatoes, they think of a heavy dish. The truth is that this salad isn’t really all that bad for you. It has some lean grilled meat, boiled potatoes, no cheese, and a very light dressing. Couple that with the fact that it’s incredibly filling and I call it a great dinner! Serves 2 as a meal or 4 as an app. A really filling salad made with grilled sirloin steak and boiled and marinated new potatoes. Delicious as an appetizer or a meal! 1) Mash garlic cloves in a small bowl with a fork with the kosher salt to form a paste. Stir in chili powder and lime juice to form a thick paste. 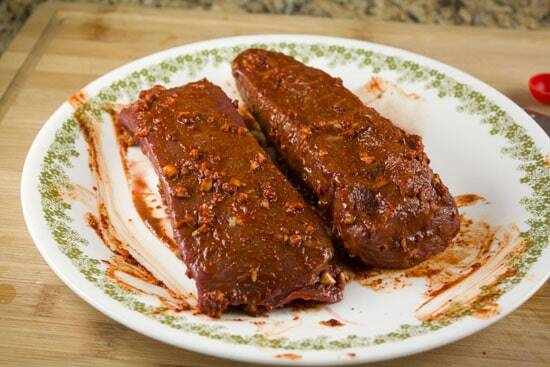 2) Coat steak with paste and let rest for 10 minutes. 3) Grill steak over high heat for 5-6 minutes per side for medium-rare (note: this depends on the thickness of your steak). You are shooting for 135-140 degree internal temp for medium-rare. 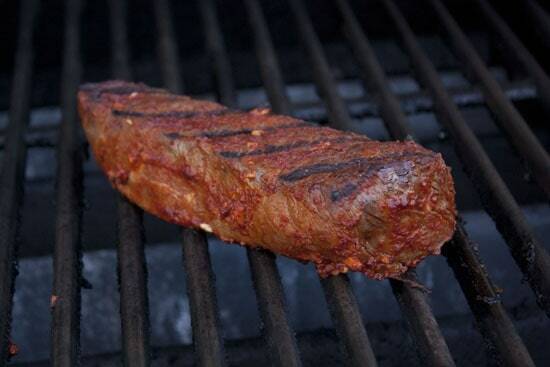 4) Let steak rest off the heat for 5 minutes. 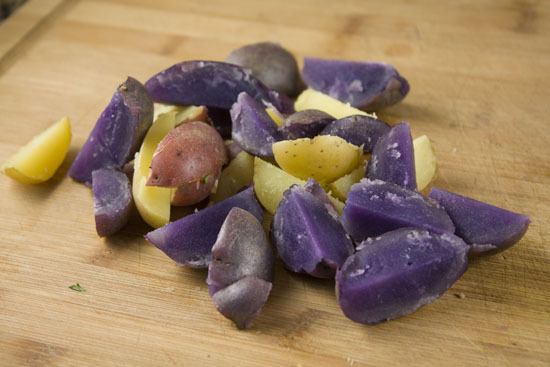 5) Boil potatoes until tender, about 10 minutes and then let cool slightly and half or quarter them. 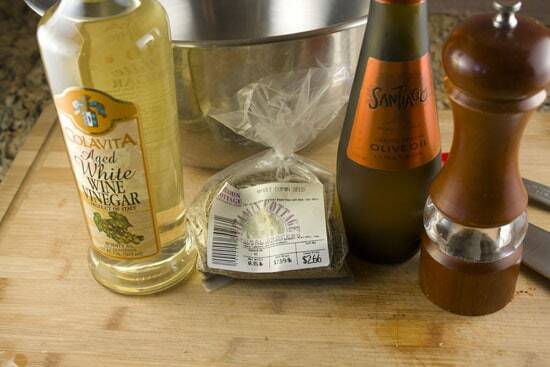 6) Whisk together olive oil, white wine vinegar, cumin, and salt and pepper in a bowl. 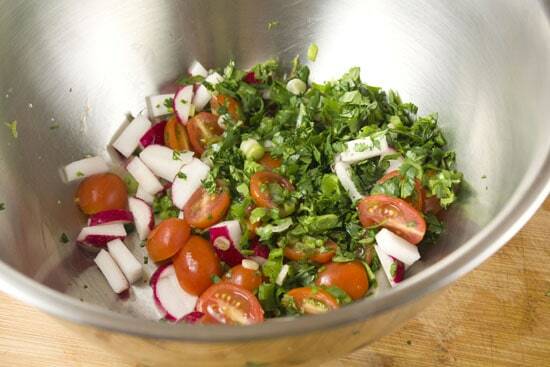 Toss dressing with sliced radishes, tomatoes, and potatoes. 7) Thinly slice steak and toss in with other stuff. Toss to coat with dressing. 8) Serve over a bed of greens or spinach and sprinkle with scallions and cilantro. Recipe adapted from Eating Well in Season. 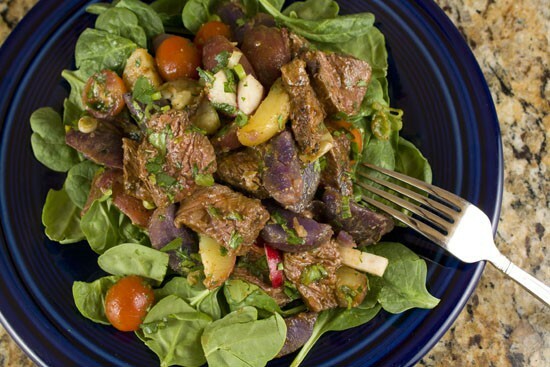 You could use a lot of different cuts of meat for the steak in this Steak and Potato Salad recipe. Flank steak would work great, but I went with a few small sirloin steaks. I ate a full one of these (they were about 7-8 ounces) and Betsy ate a half of one. To give the steaks some great flavor, mash together all of the ingredients under the steak marinade and completely cover the steaks in the paste. It’s okay to go thick on it. Let these sit for about 10 minutes to really absorb some flavor. There’s really nothing like grilling these so I recommend that if you have access to a grill. If you don’t, you can always pan sear them as well (a cast iron skillet would work best). Either way, cook the steaks on high heat for about 5-6 minutes per side for a one inch thick steak. That should leave you with about a medium rare steak. If you want to be a perfectionist, use a thermometer to get to 135 degrees Fahrenheit. Besides the steak, there isn’t much prep to this salad. It’s pretty easy to throw together. First, boil some new potatoes. I like to get the variety packs with different colors. I just think they look cool. 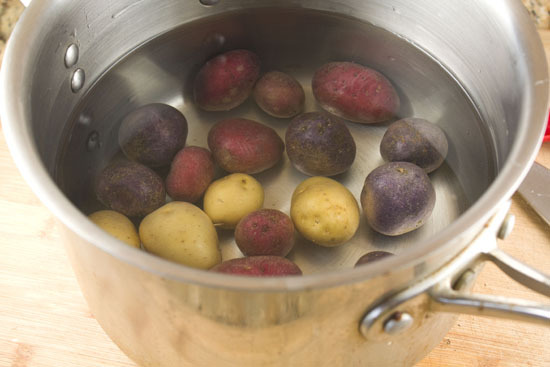 Boil them for about 10 minutes until they are soft and then let them cool and dice them up into quarters or halves. Look at those purple ones! Love that color. This Steak and Potato Salad has a really light dressing that all of the ingredients get tossed in. It’s basically just vinegar, oil, cumin, and some salt and pepper. It’s really simple, but has a great flavor. While the potatoes are boiling and the steak is resting from its grill time (let it rest for at least five minutes before slicing it), go ahead and prep all the other ingredients. I tossed in some potatoes, radishes, scallions, and cilantro. When your steak has rested, slice it thinly. About 1/4 inch pieces are pretty good. 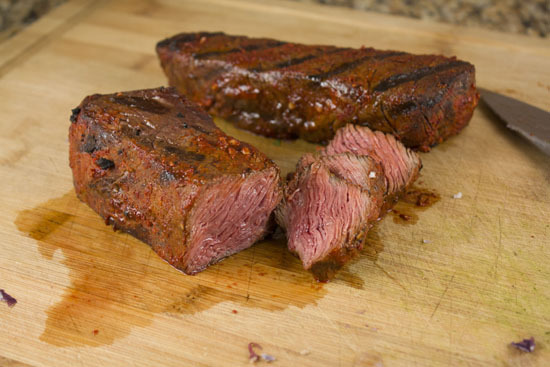 This is plenty of steak for 2-3 people as a meal or 4-5 people as an appetizer. Then just whisk together all the dressing ingredients in a large bowl and toss everything in! Make sure all the ingredients are coated evenly with the dressing. As you toss the stuff together, you’ll notice that some of the marinade from the steaks will mingle with the dressing. That makes for good flavors. Then just serve this mixture up over some baby spinach or any green that you want. I love this Steak and Potato Salad this time of year. It’s filling, but I still consider it lighter than most meat and potato dishes. Have some steak. Have some potatoes. Call a salad! This looks really good–I’ll have to try it! It reminds me a little of a salad I make for my husband with steak and crumbled chevre over arugula. We’re very big “meat and potatoes” people, but it’s nice to just have a salad once in a while when it’s really hot and you don’t feel like eating (or heating the house up!) I’ll have to add this to the recipe queue. Thanks! LOVE! 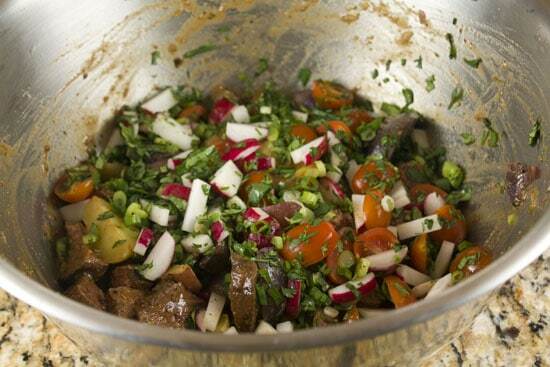 This salad has so many things that I absolutely adore: potatoes, beef, radishes. That’s definitely how I make my salads. You could sub the meat for chicken, salmon, tuna or even eggs. Yes, salad is much better with steak in it. I like using a Thermapen to double check my steak temps, love that super fast reading. What kind of temp are you cooking at, the 450-500f range or do you like to go even higher? I think my gas grill can get a bit hotter than that if I have it all the way cranked. Maybe 550-600 range? Wish I could do hotter!